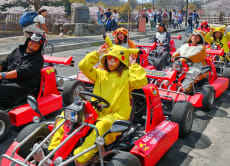 Let's explore osaka with Go Kart & funny costumes and enjoy the beautiful view of Osaka's most famous landscapes with this program! Our tour guides today were so friendly and the tour was amazing. Having done this before a few years ago, I had an idea of what to expect, but the guides went above and beyond taking us through some back areas and empty streets. This was the best!! They guides were awesome.. he took lots of photos and took us to see some sights.. can not recommend enough!! !